It came! For two years I’ve been trying to get a Bag of Crap. * You’d think I’d have enough crap living with a husband, three kids, and two cats, but no, I wanted more. One friend has gotten a bag of crap at least five times, which is a lot. I’ve been SO jealous of all her crap! But this time it was my turn. Some of you are still confused. Understandable. Most people don’t do a blog post about the joy of a bag of crap. Well, as you know I am not most people. I should qualify, this is not just any crap, this is the creme de la creme of crap. (For which I paid three dollars plus five dollars shipping.) When I purchased it I knew it might be crap. Or it might be…something amazing. The mystery is part of the fun. And today the mystery was solved. So S set off to bring me my bag of crap. It’s a really nice drum set. We have seen it on Woot twice before and debated whether or not to buy it for S. It’s worth quite a bit more than eight dollars! No, you’re not looking at mirror images. We purchased the exact same item for S a couple months ago. For his birthday. Which is in two days. 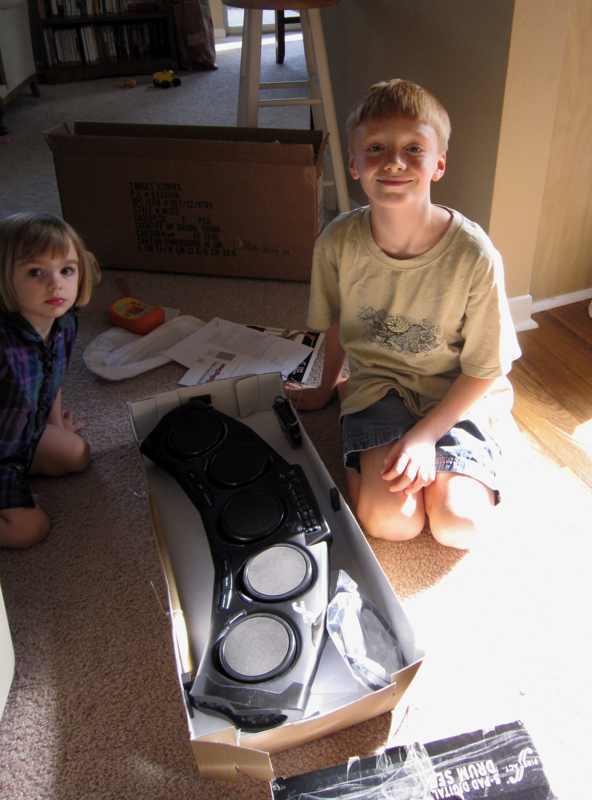 The original drum set came in a brown box. The “crap” drum set did not. Did I mention S went to get the mail? Did I mention his birthday is in TWO days? Should I mention how excited he was to see this item? Should I mention how upset I was to find out our great present for him was ruined??? We now have two drum sets. (“Crap” cannot be returned. It is our ‘crap’ to keep and deal with it as we may. Those are the terms at purchase.) The ‘crap’ item would have been AWESOME if we hadn’t purchased the first set for more money a couple months ago. Do we sell it? Share with K and J? Share the love with another friend or relative? I guess we’ll just have to wait and see! Will I try to get another bag of crap? Definitely!! But maybe not right before a birthday! This is a great site Jen G. got me hooked on a couple years ago. They sell one item per day. That’s it. The next day they sell another item. Sometimes it’s not interesting, sometimes it’s a great deal. And sometimes they have a Woot-Off. This is where they sell a bunch of items (one at a time) for a day or so. Once during every woot off they sell a bag of crap. People work REALLY hard to get this, because it is often something good. It’s very hard to get one, because the servers often lock up and the bags of crap sell out QUICKLY. Now you know. But don’t get in the way of my bag of crap. I have been waiting to learn what this whole "Bag of Crap" thing is. I have been to the website, but clearly never knew about the "Bag of Crap". Now I know! 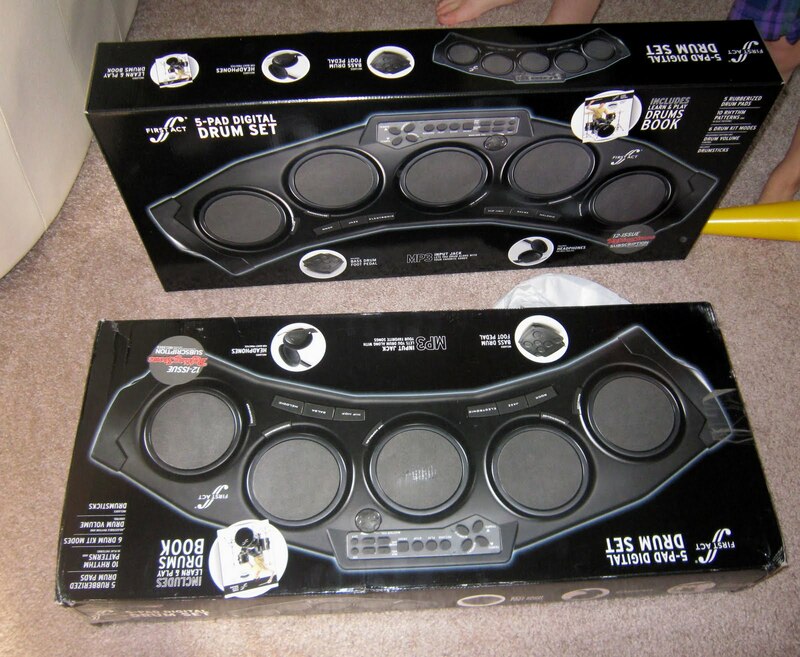 I am thinking about the drum sets…and thinking it would be a nice addition to our piano duet. Think of the funds we could raise for the zebras now! Mel, that is HILARIOUS. What a GREAT idea!! Especially because the kids could be involved in our tour. Fabulous! Well, I'm thrilled you not only got your first bag o' crap, but that it was truly NOT crap! Not so thrilled about the ruined surprise.I should have told you to never, ever open your bag o' crap in the presence of your children. It's Rule 102, after winning the bag o' crap (101). Mea culpa. This allows any good contents to be stashed away as gifts and prevents any true crap from being claimed and amalgamated into all of their other crap – you know, the crap you have to pick up day after day after day…And for the record, I've only gotten four. 😉 And I'm really, really glad the drums ended up at your house and not at mine. Clearly, there was a reason God didn't let me win this time: He would not give me more than I could bear. Lol, Jen! And sorry…FOUR. It felt like 20. :)Please note, I didn't open the package..it wasn't in a brown box…only the original packaging. So since Samuel got the mail, he knew exactly what it was before me! If I had gotten to it before he got home I at least could have hidden it…Ahh, well, what's done is done. At least he got a present he liked. Imagine if it was a gift he hated and I had TWO of them! Ah. That makes sense. Well, next time, I guess you'll have to make sure you beat Samuel to the mail when you expect a bag o' crap. Well … now I’m not sure my heart is strong enough to withstand the ups & downs of winning a bag of crap. I’ll have to ponder that potential anticipation. In the meantime, it sure is fun reading about other people’s bag of crap discoveries!